At Stratus Building Solutions, we understand the importance of a clean, inviting and healthy work environment. It's crucial that your office space makes a great first impression for new clients and keeps that impression with your current customers. A healthy space also creates a positive working environment for your employees, with the power to boost productivity while improving employee morale. Our team knows that a fresh office space is the first step toward success, and we are here to help you succeed. We offer state-of-the-art commercial cleaning tools and techniques designed to leave a deep clean and keep your office space looking like it did when you first opened your doors for business. We bring more than a decade of commercial cleaning experience, and our cleaning products, equipment and techniques have been tried and tested for quality assurance. When you work with our janitorial team, you can head to the office knowing you will be greeted with a fresh, clean office space to start your day. Whether you have one location or multiple locations, we have the commercial office cleaning plans, including our Stratus Building Solutions' National Account Program, to meet your needs. We have business cleaning companies in more than 32 cities through the United States and Canada. What Can You Expect from Stratus Office Cleaning Services? We pay attention to the details so you don't have to. Our certified cleaners will take care of everything from baseboards and faucets to carpets and bathrooms, and everything in-between. We do more than just clean, we keep your office space free from germs, bacteria, dirt and grime that can spread quickly through your workplace. Best of all, our janitorial team does this without the use of harsh chemicals, which protects both your employees and your customers. Standard janitorial cleaning services are never enough for Stratus. We go one step further. We use our powerful Sani-Spritz or UV-C Sanitation Wand for hard-to-reach spots and high-traffic areas. 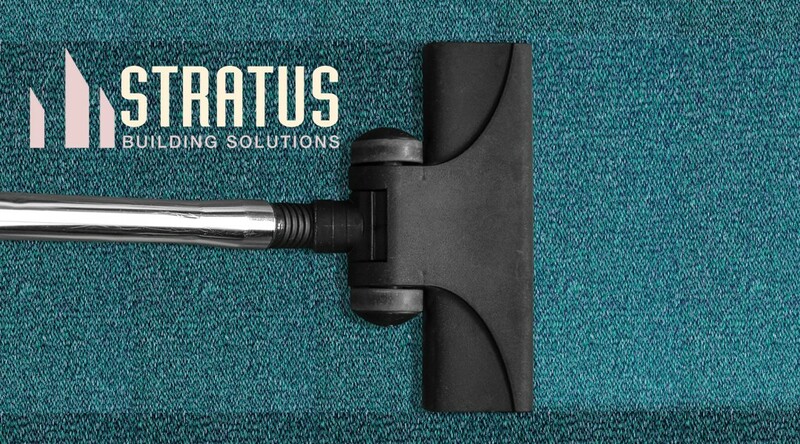 Stratus is committed to providing every customer with high-quality green cleaning solutions. To make this a reality, we use certified-green cleaning products, HEPA filtration vacuums, microfiber towels, and recycled material and tools whenever possible. As a professional office cleaning company, we ensure our entire business cleaning staff is uniformed, badged and fully vetted before stepping foot in your office. You also can depend on our team to be on time, every time. Every Stratus Building Solutions commercial cleaning franchise is fully protected with liability, bond and workers compensation insurance. We strive to provide five-star office cleaning services every time. If, however, you are not satisfied with our services for any reason, we will come back and make it right. If you're ready for a clean, fresh and healthy office space, contact Stratus Building Solutions today to learn more about our business cleaning services.